Whether you are active or relax, there will always be a Tempo to discover new sensations at your own pace. 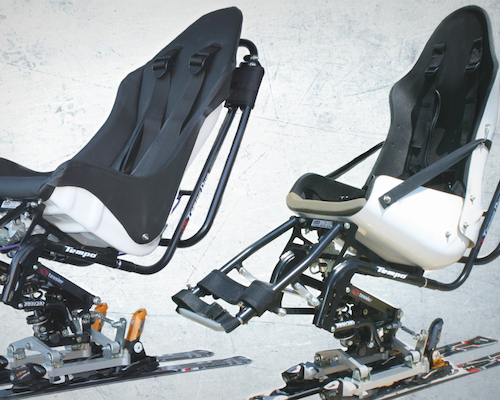 Tempo Duo brings a maximum of comfort and pleasures to every person, whatever their disability, who wants to discover the joy of riding with the feeling to ski almost alone. Modular – Easy removable piloting bar. All TESSIER seats are adaptable on Tempo. Several models of shock absorbers are available. Footrest in function of your needs: Active or Relax. Comfortable – A maximum of comfort thanks to a full suspension system add to an adjustable shock absorber. Comfortable and ergonomic bucket seats. Versatile – Ideal for ski schools and associations. Tempo is also usable in Solo version. Only one frame for two kinds of use.